Home / Blog / Why do projects fail? Project failure is one of the least discussed Project Management topics. This isn’t surprising, since each new project begins with excitement, enthusiasm and no expectation of failure. 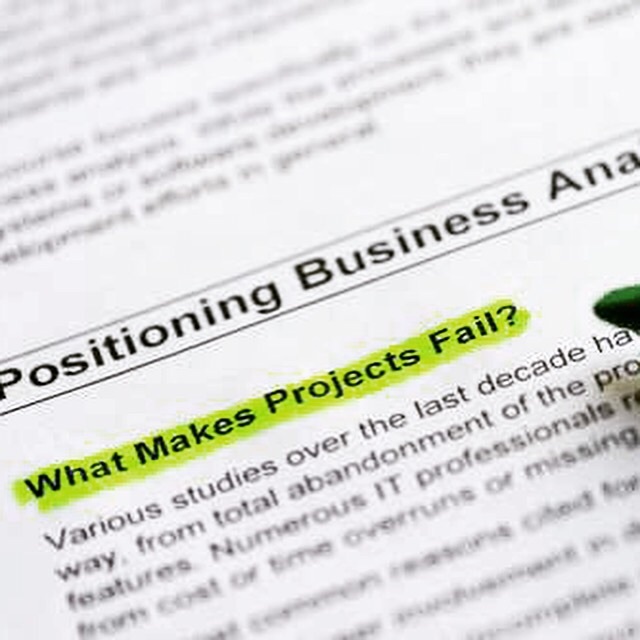 Understanding why projects fail, is part of making your projects a huge success. You must have clear super specific goals from the very start of your PM process. You need clarity on what a successful project looks like, in order to meet stakeholders’ expectations. Your initial kick-off meeting might be lengthy, but it’s a good opportunity to outline the costs, resources and time. It also helps to check in and revisit the goals, together with the project plan, at every milestone, so you can stay focused. Have you analysed the risks associated to your project and put contingencies in place? Risk management is not a task for just one person. It requires a team to fully consider the constraints and restrictions at each phase of a project and to explore the most appropriate solution. Managing a project is about managing people and this includes managing expectations. Your ability to communicate at all levels, make timely decisions and assign appropriate tasks and responsibilities will make you a Project Management pro’. In some instances ‘experience is the best teacher’, but a lot can be learned from reviewing the successes and failures of previous projects. Knowing the PM tips and tools will certainly get you out of most tricky situations. Project Management can seem like second nature to many people, but there should always be a system in place. Even in the midst of chaos there is ‘method to the madness’. Remember the systems will save you when key staff leave the project and/or company. Don’t leave anything to chance. Certain projects lend itself to a manner of various documentation and logs. These documents, such as the issues log and risk log, will enable you to track what, when and why a particular decision was made or who took action. It could also be useful for issues relating to compliance and other legalities. Ineffective communication can be disastrous. Listening, offering feedback, and providing timely updates will inspire confidence in your ability as a Project Manager and your integrity as a leader. Adopting systems that encourage transparency will not only help to build trust, it will also boost the efficiency of your projects. Other tasks can be delegated but this is the responsibility of the Project Manager. Monitoring and tracking progress will enable you to identify instances where more resources are needed to complete a project on time. Limited resources on a project is the result of inept planning, poor tracking and inaccurate cost estimations. It will certainly lead to low morale and poor performance. Where there are multiple projects it’s important to take a birds-eye view and frequently review the activities of each project collectively. You must maintain good communication. It’s important to set the standard and reinforce the values of your organisation, particularly when outsourcing, forging partnerships and working on collaborations. You need to ensure everyone has a vested interest in the project’s success. This can be achieved by promoting professionalism within your team. Whether it’s conflict within your project team, a disgruntled stakeholder or missed deadlines, the warning signs of potential failure are always there. You must take immediate action. Maintaining open communication will help with problem solving. Be transparent and wherever possible work collaboratively. Make your projects a success with Creative Training Hub and join us on our one-day Project Management workshop. See here for dates.